Have it for breakfast, snack time, or dessert! 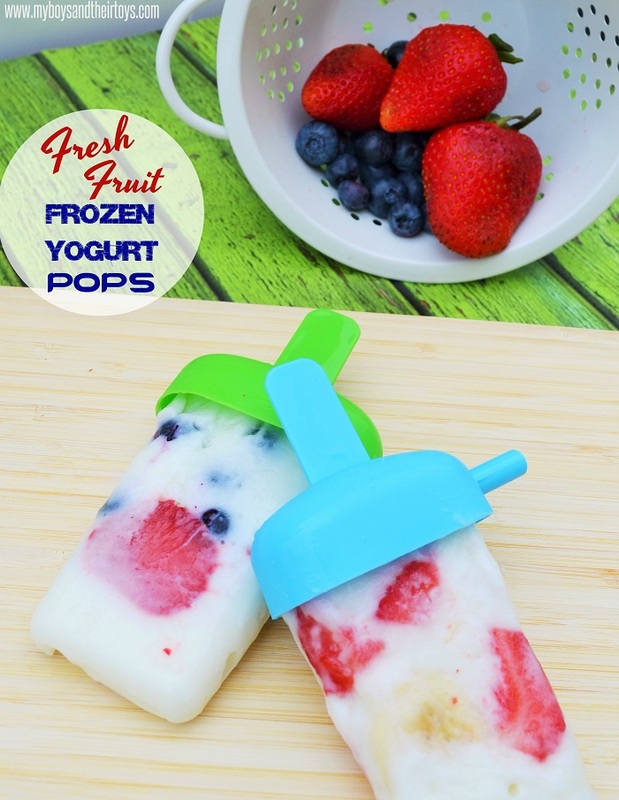 These fresh fruit frozen yogurt pops will be a huge hit anytime of day. Made with delicious Yoplait® yogurt and fresh fruit, this wholesome treat is super easy to make. I’m not sure if it’s the summer heat or growth spurts, but my boys are constantly asking for something to snack on. They love to eat yogurt right out of the container, but today I decided to switch things up. I froze it! Yes, frozen yogurt is nothing new, but what kid doesn’t want a popsicle for breakfast? Yogurt has great benefits like calcium, live & active cultures, Vitamin D and protein. Plus Yoplait has actively worked towards a path of goodness by removing high fructose corn syrup and aspartame, and recently decreasing the amount of sugar in their product by 25%! Thinly slice fresh fruit and set aside. Fill each popsicle mold 1/3 of the way with yogurt, then slide fruit down the sides. This helps the fruit stand out, instead of getting stuck in the middle. (And really pretty too!) Continue filling the popsicle mold with yogurt, then fruit, finally topping off each mold with the remaining yogurt. Freeze for a minimum of 4 hours. I recommend making extra so you have some on hand anytime. Because everyone wanted different fruit, I used peaches for my oldest son, bananas and strawberries for myself, and youngest son, and strawberries and blueberries for my husband. 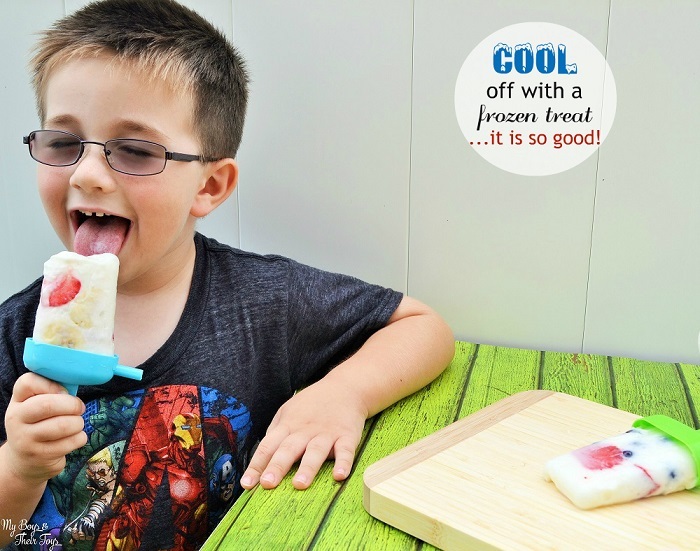 The frozen yogurt pops were really simple to make, and a snack everyone enjoyed. I especially liked that it was a healthier snack alternative, and something I could feel good about giving my family. Plus, they are great on the go! Whether you’re heading to the pool, office, or hanging out at home. This is a guilt-free snack option. And a treat we will definitely try again! Have you made frozen yogurt pops at home? Fresh fruit is always one of my favorite snacks. I’ve made yogurt pops several times. Yum. I can’t believe I still haven’t made these at home yet! 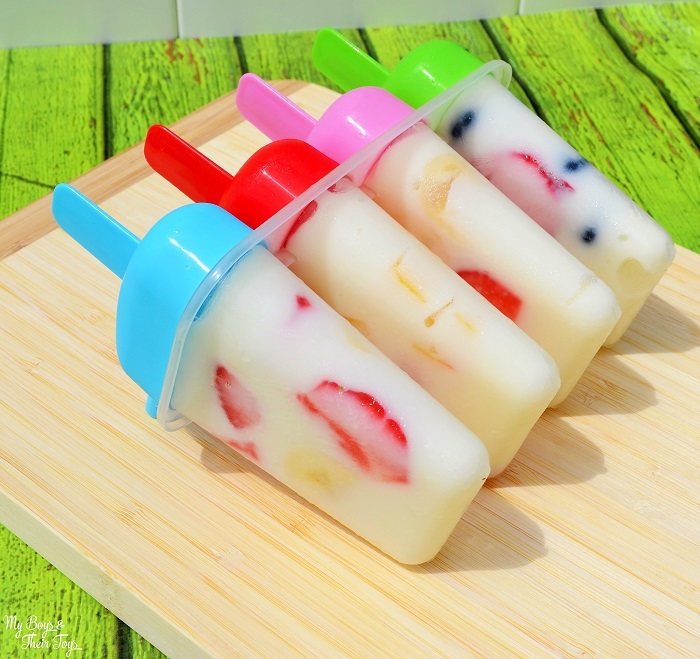 Your yogurt pops looks so refreshing! Those look great! I will have to give them a try. Thanks for sharing! 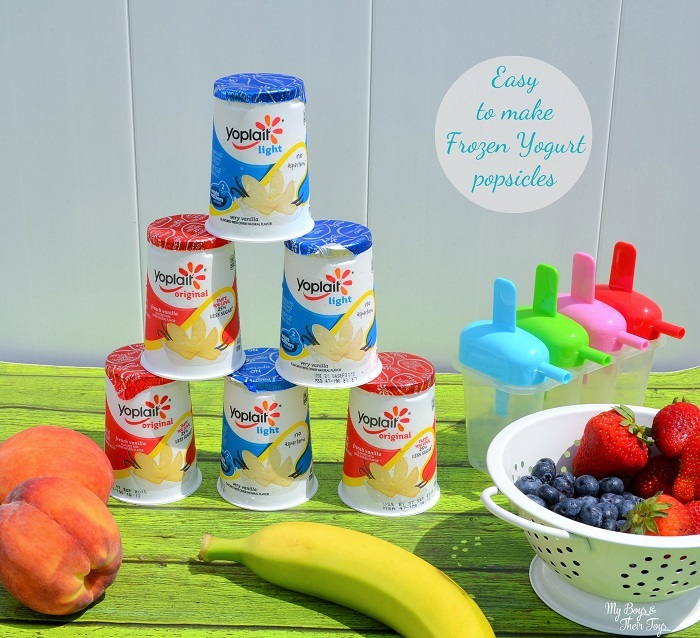 We love making yogurt pops in our home too. I love that they are healthy and tasty at the same time! I love making these in the summer. I use peaches and strawberries. So refreshing!